As part of the Tasmanian Quoll Conservation Program, we work with organisations in Tasmania and on the mainland to ensure a genetically diverse captive breeding population and eventual release into the wild for these beautiful animals. Just in time for breeding season, we recently had a shuffle of our Eastern Quolls - sending two of our male quolls from last year’s breeding season up to Mt. Rothwell Conservation and Research centre, and another two up to Devil’s Ark. While Devil’s Ark is a new addition to the program, we’ve been working with Mt. Rothwell for quite a few years now & they have a number of quolls in their breeding program originally from Bonorong. They are no doubt enjoying their new life amongst 420 hectares! We also received two lovely male quolls (Aster & Tarra) from Trowunna Wildlife Park (which is in the north of the state). These two lucky boys will be paired with our female quolls for this breeding season. 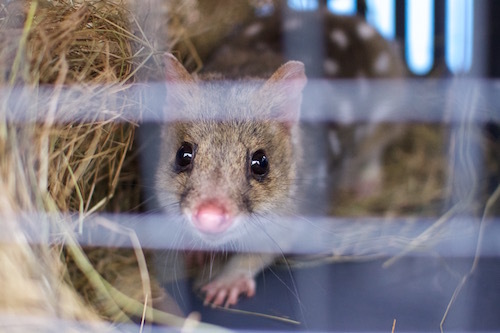 Aster, our new male Eastern Quoll from Trowunna, peeking out while we cleaned his temporary enclosure. And while they’re not a part of the breeding program, we were also the recipient of two young male spotted-tail quolls for our display. Named Romulus and Remus (yes, we like a bit of ancient roman mythology here), these guys are taking over the job of educating our guests about our spotted-tail quolls in the wild. So next time you drop by, be sure to say hello to all our new additions… and fingers crossed, many more new additions coming soon if breeding season goes to plan! Newer PostCan count? Love birds? Read on!